Artsygranny's Digital Delights: How about a little freebie? I'm in a good mood today. My vacation starts tomorrow. The packing is all done, except last minute stuff like toothbrush. I am dreading the drive (about 17 hours) but it will be so worth it. Three of my grandchildren and their mom are going with me, so there should be lots of photo ops! Anyway, I mentioned a freebie. Here is a quick page, from a kit I designed. I call it Caribbean Sunset. As an anonymous poster pointed out in a comment, you need a password (don't know what's up with that as I did not assign one to it). 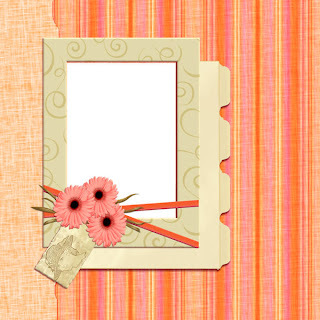 But the password is orange, the same as the other freebie quick page I offered before. Cute QP, but can`t dl q/o the password, and YES I READ THE POST! Congratulations on your new blog! It looks great. Great QP - thanks for sharing it!